Objective: To assess the evidence for the efficacy of local treatments for cutaneous warts. Methods: Systematic review of randomised controlled trials. Main outcomes measures: Total clearance of warts and adverse effects such as irritation, pain, and blistering. Study selection: Randomised controlled trials of any local treatment for uncomplicated cutaneous warts. All published and unpublished material was considered, with no restriction on date or language. Results: 50 included trials provided generally weak evidence because of poor methods and reporting. The best evidence was for topical treatments containing salicylic acid. Data pooled from six placebo controlled trials showed a cure rate of 75% (144 of 191) in cases compared with 48% (89 of 185) in controls (odds ratio 3.91, 95% confidence interval 2.40 to 6.36). Some evidence for the efficacy of contact immunotherapy was provided by two small trials comparing dinitrochlorobenzene with placebo. Evidence for the efficacy of cryotherapy was limited. No consistent evidence was found for the efficacy of intralesional bleomycin, and only limited evidence was found for the efficacy of topical fluorouracil, intralesional interferons, photodynamic therapy, and pulsed dye laser. Conclusions: Reviewed trials of local treatments for cutaneous warts were highly variable in methods and quality, and there was a paucity of evidence from randomised, placebo controlled trials on which to base the rational use of the treatments. There is good evidence that topical treatments containing salicylic acid have a therapeutic effect and some evidence for the efficacy of dinitrochlorobenzene. Less evidence was found for the efficacy of all the other treatments reviewed, including cryotherapy. Viral warts are common, benign, and usually self limiting skin lesions that occur usually on the hands and feet.1 Extragenital warts in people who are immunocompetant are harmless and usually resolve spontaneously within months or years owing to natural immunity. In view of this, a policy of not treating them is often advised. However there is considerable social stigma associated with warts on the face and hands, and they can be painful on the soles of the feet and near the nails. Many patients request treatment for their warts. Many local treatments are used for warts, but knowledge on the absolute and relative efficacy of these is incomplete. We systematically reviewed randomised controlled trials of any local treatment for uncomplicated warts to assess the evidence for their efficacy. We conducted computer searches with standardised search strategies.2 We searched Medline (from 1966 to May 2000), Embase (from 1980 to August 2000), and the Cochrane controlled trials register (March 1999). We manually searched cited references from identified trials and recent review articles. We contacted pharmaceutical companies and experts in the specialty. We included non-English papers, which we had translated. Two reviewers (SG and IH) independently examined the full text of all studies identified as possible randomised controlled trials. All studies in which participants were randomised to different interventions were included. The reviewers assessed the quality of the methods from concealment of allocation, blinding of outcome assessment and handling of withdrawals, and dropouts.3 They also considered the adequacy of sample size, comparability of treatment groups at baseline, overall quality of reporting, and handling of data. Trial quality was classified subjectively and then by consensus as high, medium, or low quality. Trials clearly showing adequate concealment, blinding, and intention to treat analysis were classified as high quality. The trials were then examined in detail and a descriptive synthesis drawn up, with pooling of dichotomous data when trials had a similar design, methods, and outcome. The main outcome examined was the complete clearance of warts. Data were pooled with the Cochrane Collaboration's review manager software. Because of the overall heterogeneity of the trials we used odds ratios with 95% confidence intervals as the main measure of effect with a random effects model. Fifty trials were identified from 45 papers (table).4–48> Further details of included and excluded trials are available in the Cochrane Library.49 Evidence from these studies was generally weak largely because of a lack of high quality trials. Overall, 41 (82%) trials were classified as low quality and seven as intermediate quality. Only two were classified as high quality. 41 43 Moreover, the heterogeneity of the methods, particularly the unit of analysis used, hindered the pooling of data for many treatments. Despite this, some useful pooling of data was possible. Seventeen trials with placebo groups used individuals as the unit of analysis. The average cure rate of placebo preparations was 30% after an average period of 10 weeks. Thirteen trials assessed topical salicylic acid. Various preparations were used, with salicylic acid ranging from 15% to 60%; only one trial used 60% salicylic acid, most using standard preparations of between 15% and 26% with or without lactic acid. Data pooled from six placebo controlled trials showed a cure rate of 75% (144 of 191) in cases compared with 48% (89 of 185) in controls (odds ratio 3.91, 95% confidence interval 2.40 to 6.36; fig 3). 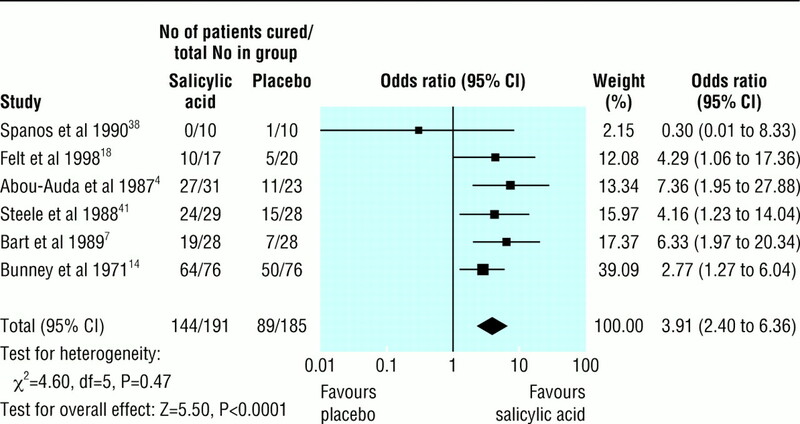 In one placebo controlled trial one of 29 patients treated with a mixture of monochloroacetic acid and 60% salicylic acid developed cellulitis.41 Minor skin irritation was reported occasionally in some of the other trials, but generally there were no major harmful effects of topical salicylic acid. Sixteen trials assessed cryotherapy. Most of these studied different regimens rather than comparing cryotherapy with other treatments or placebo. Pooled data from two small trials including cryotherapy and placebo or no treatment showed no significant difference in cure rates (fig 2). 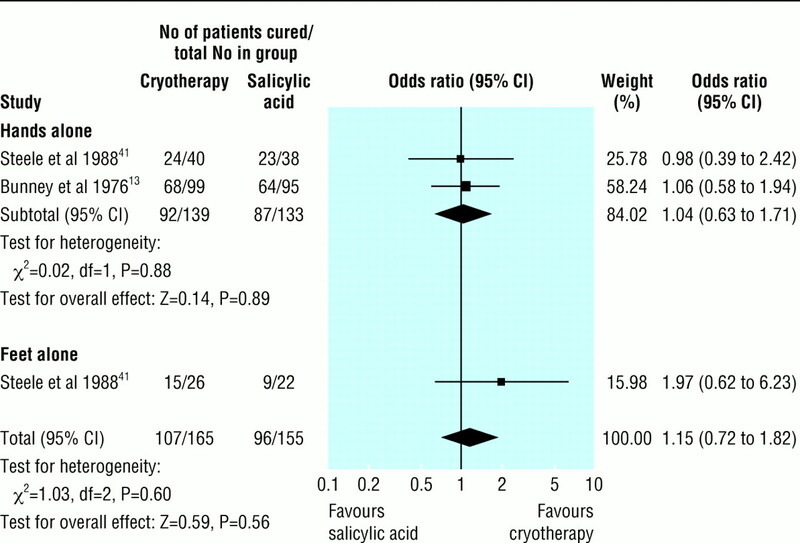 In two other larger trials no significant difference in efficacy was found between cryotherapy and salicylic acid (fig 3). Pooling of data from four trials showed “aggressive” cryotherapy (various definitions) to be significantly more effective than “gentle” cryotherapy, with cure rates of 52% (159 of 304) and 31% (89 of 288), respectively (3.69, 1.45 to 9.41). 9 16 21 37 Reporting of side effects was less complete, but pain and blistering seemed to be more common with aggressive cryotherapy. Pain or blistering was noted in 64 of 100 (64%) participants treated with an aggressive (10 second) regimen compared with 44 of 100 (44%) treated with a gentle (brief freeze) regimen (2.26, 1.28 to 3.99).16 Five participants withdrew from the aggressive group and one from the gentle group because of pain and blistering. Three trials examined the optimum treatment interval. 11 13 24 No significant difference was found in long term cure rates between treatment at 2, 3, and 4 weekly intervals. In one trial pain or blistering was reported in 29%, 7%, and 0% of those treated at 1, 2, and 3 weekly intervals, respectively.11 The higher rate of adverse effects with a shorter interval between treatments might have been a reporting artefact due to participants being seen soon after each treatment. Only one trial examined the optimum number of treatments.10 This trial showed no significant benefit of prolonging 3 weekly cryotherapy beyond 3 months (about four freezes) in participants with warts on the hands and feet. Two small trials comparing the potent contact sensitiser dinitrochlorobenzene with placebo showed some evidence for the efficacy of the active treatment. 34 48 Pooled data showed cure rates of 80% (32 of 40) and 38% (15 of 40), respectively (6.67, 2.44 to 18.23; fig 4). No precise data were found on adverse effects in either of these trials. One trial found that six of 20 participants treated with 2% dinitrochlorobenzene became sensitised only after a second application.34 All of them subsequently experienced major local irritation with or without blistering when they were treated with 1% dinitrochlorobenzene. None withdrew from the study. No consistent evidence was found for the effectiveness of intralesional bleomycin in five trials. 12 22 28 32 35 Four of the trials, with widely varying results, used warts rather than individuals as the unit of analysis and could not be meaningfully pooled. 12 22 28 35 Cure rates in all five studies ranged from 16% to 94%. Two trials showed higher cure rates with bleomycin than with placebo, one showed no significant difference between bleomycin and placebo, and one showed higher cure rates with placebo than with bleomycin. As treatments for ordinary warts, fluorouracil and intralesional interferons are more of historical interest, with most of the trials reviewed from the 1970s and ‘80s. Evidence provided by all the trials was limited by the heterogeneity of the methods and design. Overall, neither treatment was strikingly effective. Four trials reported varying success with different types of photodynamic therapy. 39 42 43 46 The heterogeneity in methods and variations in trial quality made it impossible to draw firm conclusions. One well designed trial in 40 adults reported cure in 56% of warts treated with aminolaevulinic acid photodynamic therapy compared with 42% treated by placebo photodynamic therapy.43 Topical salicylic acid was also used for all participants. No randomised trials were identified that studied the efficacy of carbon dioxide laser, surgical excision, curettage or cautery, formaldehyde, podophyllin, or podophyllotoxin. Most of the trials reviewed concerning local treatment for cutaneous warts were of low quality. We had difficulty reviewing the research systematically because of the heterogeneity of study design, methods, and outcome. This hindered the pooling of data. A large number of important variables distinguished these trials from one another (box). Some used subgroup analysis to allow for these variables (for example, warts on the hands or feet). Others excluded particular subgroups such as mosaic plantar warts or participants with multiple warts. Few trials made a distinction between plane warts and common warts. In view of this heterogeneity and the low quality of most of the trials, the descriptive synthesis and pooled data in our review should be interpreted with caution. A dearth of high quality evidence prevents the rational use of treatments for common warts. Simple topical treatments containing salicylic acid seem to be both effective and safe. No clear evidence was found that any of the other treatments have a particular advantage of either higher cure rates or fewer adverse effects. Although it is widely believed that cryotherapy may succeed when topical salicylic acid has failed, there was no clear evidence to support this. Indeed some evidence shows that at best cryotherapy is only equal in efficacy to topical salicylic acid. Intralesional bleomycin is a popular third line treatment with some dermatologists, but evidence for its efficacy is limited. Topical immunotherapy with agents such as dinitrochlorobenzene is best confined to specialist centres at present in view of its adverse effects. Photodynamic therapy and the use of pulsed dye lasers may hold promise for the future. Contributors: RS performed the electronic searches. JS was responsible for the scientific aspects of human papillomavirus infection, searched for unpublished studies, and edited the manuscript. IH supervised SG and reviewed the trials. SG coordinated the searches, reviewed the trials, and was responsible for the overall management and writing of the review; he will act as guarantor for the paper. Funding Norfolk Health Authority provided funding for the translation of some trials. .Viral infections. In: Champion RH, Burton JL, Burns DA, Breathnach SM, eds. Rook textbook of dermatology.Oxford:Blackwell Scientific,1998. .The hazards of scoring the quality of clinical trials for meta-analysis.JAMA1999; 282:1054–1060. .Treatment of verruca infections (warts) with a new transcutaneous controlled release system.Curr Ther Res Clin Exp1987; 41:552–556. .Controlled study: medical therapy (5-fluouracil, salicylic acid) vs physical therapy (DTC) of warts.Dermatol Clinics1994; 14:55–59. .Salicylic acid in karaya gum patch as a treatment for verruca vulgaris.J Am Acad Dermatol1989; 20:74–76. .Treatment of verrucae vulgaris with alpha 2 interferon.J Infect Dis1986; 154:328–330. .Value of a second freeze-thaw cycle in cryotherapy of common warts.Br J Dermatol1994; 131:883–886. .Modern treatment of warts: cure rates at 3 and 6 months.Br J Dermatol1992; 127:262–265. .Cryotherapy of common viral warts at intervals of 1, 2 and 3 weeks.Br J Dermatol1995; 132:433–436. .The treatment of resistant warts with intralesional bleomycin: a controlled clinical trial.Br J Dermatol1984; 111:197–207. .An assessment of methods of treating viral warts by comparative treatment trials based on a standard design.Br J Dermatol1976; 94:667–679. .The treatment of plantar warts in the home. A critical appraisal of a new preparation.Practitioner1971; 207:197–204. .The treatment of plantar warts with 5-fluorouracil.Br J Dermatol1973; 89:96–97. .Cryotherapy of warts: a sustained 10-s freeze is more effective than the traditional method.Br J Dermatol2001; 145:554–557. .Treatment of verrucae vulgares in general practice—a randomized controlled trial on the effectiveness of liquid nitrogen and the Histofreezer.J Dermatol Treatment1992; 3:193–196. .Wart regression in children: comparison of relaxation imagery to topical treatment and equal time interventions.Am J Clin Hypnosis1998; 41:130–137. .Wart treatment with anthralin.Acta Dermato-Venereologica1984; 64:177–179. .A comparison of acyclovir cream versus placebo cream versus liquid nitrogen in the treatment of viral plantar warts.Dermatologica1984; 168:178–181. .Reduced dose of bleomycin in the treatment of recalcitrant warts.J Am Acad Dermatol1986; 15:1002–1006. .A controlled trial on the use of topical 5-fluorouracil on viral warts.Br J Dermatol1975; 92:93–96. .Cryotherapy of viral warts.J Dermatol Treatment1996; 7:29–31. .Clinical trials of interferon-gamma in treating warts.Ann Dermatol1990; 2:77–82. .Clinical trial of Jatropha curcas sap in the treatment of common warts.Fitoterapia1997; 68:160–162. .Cutaneous cryosurgery in family medicine: dimethyl ether propane spray versus liquid nitrogen.Atencion Primaria1996; 18:211–216. .Locally injected bleomycin in the treatment of warts.Dermatologica1983; 167:86–89. .Application of beta-interferon in virus-induced papillomas.J Invest Dermatol1990; 95:149–51S. .The treatment of plantar verrucae by triggering cell-mediated immunity.Br J Pod Med1994; 131:883–886. .Effects of interferon-alpha on human warts.J Interferon Res1982; 2:235–243. .Hypertonic saline solution vs intralesional bleomycin in the treatment of common warts.Dermatol Venez1992; 30:176–178. .Pulsed dye laser versus conventional therapy for the treatment of warts: a prospective randomized trial.J Am Acad Dermatol2000; 43:275–280. .Treatment of multiple and stubborn warts in children with 1-chloro-2,4-dinitrobenzene (DNCB) and placebo.Dermatol Rev Mex1989; 33:245–252. .Intralesional bleomycin in verruca vulgaris. Double-blind study.Dermatol Rev Mex1981; 25:158–165. .Double-blind randomized clinical study on treatment of warts with fluouracil-containing topical preparation.Z Hautkr1981; 56:41–43. .The treatment of recalcitrant viral warts with high dose cryosurgery under local anaesthesia (abstract).Br J Dermatol1988; 119(suppl 33): 38–39. .Effects of hypnotic, placebo, and salicylic acid treatments on wart regression.Psychosom Med1990; 52:109–114. .Photodynamic inactivation of virus warts: a controlled clinical trial.Clin Exp Dermatol1979; 4:81–85. .Liquid nitrogen and salicylic/lactic acid paint in the treatment of cutaneous warts in general practice.J Roy Coll Gen Pract1988; 38:256–258. .Monochloroacetic acid and 60% salicylic acid as a treatment for simple plantar warts: effectiveness and mode of action.Br J Dermatol1988; 118:537–543. .Recalcitrant hand and foot warts successfully treated with photodynamic therapy with topical 5-aminolaevulinic acid: a pilot study.Clin Exp Dermatol1999; 24:154–159. .Photodynamic therapy with 5-aminolaevulinic acid or placebo for recalcitrant foot and hand warts: randomised double-blind trial.Lancet2000; 355:963–966. .Intralesional recombinant alpha-2 interferon for the treatment of patients with condyloma acuminatum or verruca plantaris.Arch Dermatol1986; 122:272–277. .Intralesional interferon: ineffective in common viral warts.J Dermatol Treatment1997; 8:169–172. .Photodynamic inactivation of verrucae vulgares. II.Acta Dermato-Venereologica1977; 57:445–447. .The treatment of plantar warts with a keratolytic agent and occlusion.J Dermatol Treatment1991; 2:59–61. .Immunotherapy v cryotherapy for hand warts; a controlled trial (abstract).Scottish Med J1983; 28(2): 191. .Local treatments for cutaneous warts. In: Cochrane Library. Issue 2. Oxford:Update Software,2001. Relatively minor conditions, without serious consequences and with little associated pain, offer an ideal environment for randomised trials. A good example is warts. Warts are common, and there should be little resistance from patients to participating in a trial of relatively short duration as it would be clear that they could switch to a different treatment shortly. Yet the systematic review of treatments for warts by Gibbs and colleagues shows surprisingly few trials of most treatments. Also interpretation was made more difficult because of the variation in study design. Several design options exist. Firstly, each patient could simply be randomised to a single treatment and each patient's outcome summarised across all of his or her warts. (A variation would be to treat just one wart per patient.) Secondly, individual warts could be randomised, if possible ensuring that each patient has at least one wart in each treatment group. The analysis should take account of the clustering.5 Thirdly, treatment could be restricted to two warts for each patient, randomly allocating these to the two treatment arms. A simple paired analysis can then be done, making this design an attractive option. It would seem preferable to take advantage of the multiple lesions to compare treatments within patients. However, an important additional consideration is a possible systemic effect. The simultaneous use of two treatments within the same patient assumes that their effects are independent. For example, an active treatment with some systemic effect would influence the outcome of warts treated with placebo, so that an effective treatment might seem ineffective. This possibility should always be considered. A further question is whether there might be qualitative differences between patients with few and many warts. For systematic reviewers, a set of trials using a mixture of different designs of varying validity is certainly challenging. All of the methodological issues mentioned are of course in addition to the standard assessments of trial quality. It is helpful to provide details of the design used and assess whether the analysis was statistically correct. These aspects should help to determine which studies to include in any meta-analysis.
. People and eyes: statistical approaches in ophthalmology. Br J Ophthalmol 1998; 82: 971–973.
. Design principles and statistical considerations in periodontal clinical trials. Ann Periodontol 1997; 2: 42–63.
. Photodynamic therapy with 5-aminolaevulinic acid or placebo for recalcitrant foot and hand warts: randomised double-blind trial. Lancet 2000; 355: 963–966.